On Aug 5, Indonesian police arrested five members of a terror cell in Batam. Their leader, Gigih Rahmat Dewa, was in contact with an ISIS militant and planned to hit Marina Bay with a rocket. The Sunday Times looks at what he and his group got up to. When several radicals from Indonesia began travelling to Syria to fight over the past two years, militant leaders turned to a low-key IT expert to help make arrangements for them. From his home in Batam, minutes from Batam Centre Ferry Terminal where ferries travel to Singapore and Johor Baru, Gigih Rahmat Dewa planned their route, say regional intelligence officials. The IT support worker in an electronics factory, now 31, was in regular contact with militant Bahrun Naim, one of the pioneer radicals who made their way to territory held by terror group Islamic State in Iraq and Syria (ISIS). Through Facebook chats and e-mail, they discussed travel plans for aspiring fighters - Indonesians heading to ISIS-held areas, but also Uighur hardliners who wanted to join fighters in eastern Indonesia. Gigih also became the "amir", or leader, of a terror cell that he called Katibah GR - or "GR cell". They held meetings to reaffirm their beliefs and trained with airsoft guns in open fields, moving around so as not to raise suspicions. Over time, these plans turned to plots for attacks nearer home. One target was clearly visible from a hilly area in Batam: Marina Bay in Singapore. Indonesian officials detected that Gigih and Bahrun were discussing plans to launch a rocket from Batam, and notified their counterparts in Singapore earlier this year. But they needed more evidence to build a case against the group. Gigih and members of his group were placed under surveillance. When a suicide bomber attacked a police station in Solo, Central Java, on July 5, investigators found the bomber - Nur Rohman - was linked to Gigih and had been in contact with the Batam group, Riau Islands police chief Sam Budigusdian said. Satisfied that they had enough information of their involvement in terrorist activity, members of Indonesia's elite counter-terrorism unit Detachment 88 began planning a raid on the cell members. On Aug 5, Gigih left the house with his wife and daughter on his motorcycle early in the morning. He dropped off the girl at his in-laws' home and took his wife to her workplace near Batam Centre. The officers had been tailing him all along and when he was riding to work alone, they stopped his bike and placed him under arrest. Since then, Gigih's neighbours have been speaking to the media about him. He and four other group members arrested that morning - field commander Trio Syafrido, 46, a bank officer, and cell members Eka Saputra, 35, Tarmidzi, 21, and Hadi Gusti Yanda, 20, all factory workers - were flown to Jakarta last week. A sixth man, Tegar Sucianto, 19, was released as he was not found to be a part of the group. All five suspects are now held at a police facility in Depok, West Java, where they are being interrogated by counter-terrorism officials. It will be some weeks before more information on the group's involvement in terror is revealed, and a while before they go on trial. Several questions remain unanswered. How did Gigih and his group get radicalised? How regularly did they travel in the region? Meanwhile, friends, family members and neighbours have differing accounts of what Gigih was like. What is clear is that he was a family man, but some found him to be a neighbour who sounded like he had something to hide. Gigih was born in Pemalang, Central Java, in 1985, the third of four siblings. His parents were teachers and when they died while he was young, he moved to Solo to live with an aunt and attended high school there. He reportedly spent some time trying to further his studies in Malaysia too. His older sister Intan Hapsari, 40, told The Sunday Times over the phone that he had studied economics at a university in Semarang but dropped out. He moved to Batam several years ago to live with his older brother and completed a diploma course in information technology at a local polytechnic there. Two years ago, he married his wife in Batam. They have a young daughter and are expecting their second child, due in two months. Ms Intan said her brother told her: "I am not a radical, what more to bomb or rocket. No such thing". She added of Gigih: "He's no troublemaker and wouldn't do weird things. He is my diamond." Gigih's family members and friends told The Sunday Times they could not have imagined he was a "terrorist". He was clean-shaven and always dressed casually in T-shirt, jeans and boots. He loved the outdoors, went hiking, and had been to Malaysia and Singapore for holidays with his wife. He was also friendly, helpful and studious, they added. Gigih's wife, who wanted to be identified only by her initial I, told The Sunday Times she learnt of his arrest from news websites. She had not seen him since then, but they spoke on the phone. "I was shocked and very sad," she said. "My husband is a private person. He is friendly with everybody and likes to help people. "My biggest hope is for him to be released as soon as possible. My husband did not and has not been proven to have committed acts that would threaten security in the community or country," she added. His sister, Ms Intan, said his friends told her about his arrest. She cried "until my eyes swelled and my eyelids couldn't open", she added. She said Gigih would be the first to step up to help if a family member was in trouble. He bought a laptop as a wedding present for her although he had little cash. He was also a "sensitive soul" who loved animals and kept a pet fish. "He couldn't stand to see anybody suffering. He talked to his fish, called it "sayang" (love) and cried when it died. After that, he wrote poems about the dead fish." However, police sources said Gigih and his gang had mechanical skills and got "online training" over e-mail and Facebook messaging. These conversations with Bahrun went beyond travel plans for fighters and touched on how they could assemble firearms, make explosives and even "build that rocket". Bahrun was convicted by the Indonesian authorities in 2011 for illegal possession of ammunition and served 21/2 years in jail. Police confiscated hundreds of bullets from his home but did not find sufficient evidence to pursue terror charges that would have landed him a longer prison term. In raiding Gigih's Batam home, police seized a bow-and-arrow set, several bank books, over 2.5 million rupiah (S$260) in cash, a camera, notes and personal documents. Ms Intan claimed Gigih was not a "programming expert", but did technical support for IT-related work and had handled general affairs and workplace safety at the electronics company he worked for in Batam. She also said the bow- and-arrow set belonged to his wife, who "used it for exercise". He had complained to her about being busy with work, she said, adding: "How could he find time to do weird things if he's that busy?" 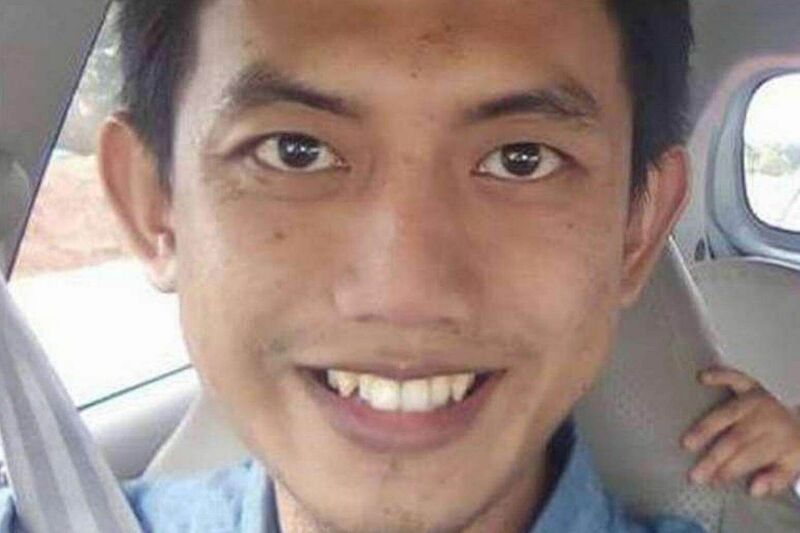 Gigih's classmate at the Batam Polytechnic, Mr Tofaneo Dean, 24, told The Sunday Times Gigih was like an older brother as he was five years older than other students. "He was always motivating us, telling us to come on time, that we must focus and that we must have a spirit for life," he said. Gigih was often among the top students, skilled at Web programming, and would be studying or building a website during breaks. He also liked cooking and eating, and would share food photos on Facebook, where he also shared photos of outdoor trips. He was not overly religious and would not chastise those who skipped prayers. After his arrest, friends begun to search for indications that he might have turned extremist. Mr Tofaneo recalls that Gigih never dated his wife. "He chatted with her via SMS and straightaway went to see her parents to ask for her hand in marriage. When we were busy trying to settle graduation matters, he was busy getting married," he said. And when police announced that the cell was also called Katibah Gonggong Rebus, or Boiled Snails Cell, after a local seafood dish, his friends got the chills. Gigih loved naming class project groups after traditional local dishes, like "gonggong rebus" and "ikan arsik", a spicy fish dish, he said. "We were shocked. We began to wonder, maybe it's really him who gave the name," Mr Tofaneo said. "If we see him again, we want to ask him, why did you go astray?" To Gigih's neighbours in the middle-class housing estate he lived in, however, his family was quite unusual. They kept to themselves and never invited the neighbours over. The lights at home were dimmed, even at night. And his wife used to wear a veil, although she no longer does so. It was the parcels they would get every day, addressed to Gigih's wife, that made many suspicious. Meatball seller Rohan, 42, who lives a few units away, told The Sunday Times that Gigih would turn his face away from people passing by his home. He had also seen small groups of people visit at night, but could not recognise them as "the house was always so dark". "No idea who they are or whether their face is round or long," he said with a laugh. "I always thought something was amiss. This family seemed to be quite well-off, but why would they stint on electricity and not turn on the lights? Why are they both so stingy with their smiles? Boxes were delivered to them every day. After the arrest, I now know why they didn't want anyone meddling in their affairs," Mr Rohan added. Another neighbour, housewife Sinar, 42, told The Sunday Times she was curious about the many parcels the couple kept getting. "They received as many as two deliveries a day, every day. I pressed one package. It felt soft, like fabric. I thought, "Wow, they must be rich to be buying new clothes every day". But they seemed to be wearing the same clothes," she said. Her husband, Mr Rifky Wahhab, 38, said the visitors would come by every two weeks and were all men. One time, his wife helped keep the package when Gigih and his wife were not in, so it would not get stolen. "We heard that when Gigih found out, he was very angry and called the company to ask them to deliver the boxes only when he or his wife were at home," he recalled. 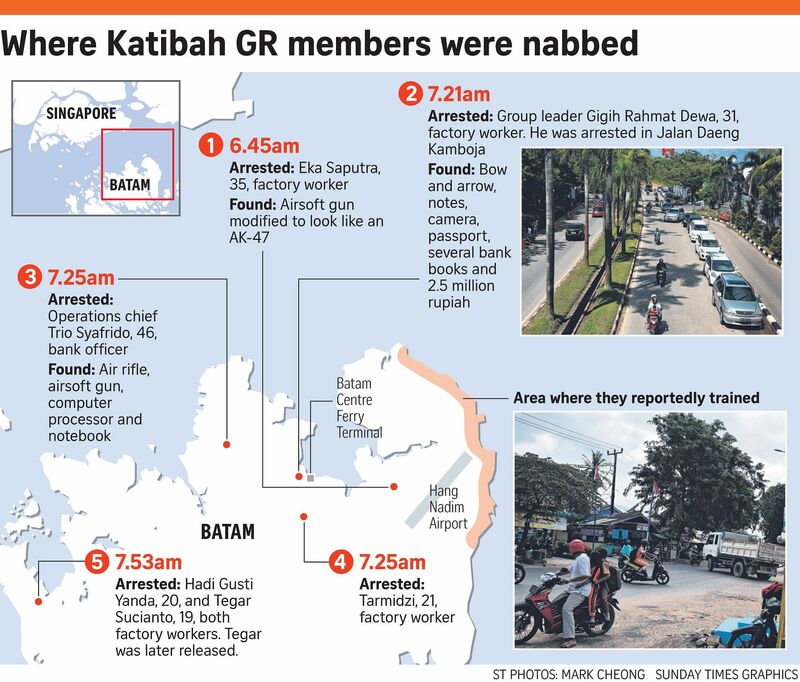 In the week since the members of Katibah GR were arrested, police investigators have established that Gigih's cell had a command structure and conducted weapons training. Members also learnt to handle airsoft guns in open fields in Batam's Nongsa district. Gigih's No. 2 was Trio Syafrido, 46, a bank officer whose Facebook postings showed clear evidence of radical leanings, including a hatred towards Shi'ite Muslims and followers of other religious groups. Riau Islands police chief Sam Budigusdian told The Sunday Times in an interview that investigators are also exploring the possibility that the cell might have links to radicalised individuals outside Batam. Indonesian police are also trying to establish "what rocket really meant". "If there is a leader from such a network (Bahrun Naim) giving an order to the local commander to "go rocket Singapore", that's something we cannot take lightly," he said. "It's all being examined. It's not possible to attack a country without having their people inside that country," he added. "Rocket is only a phrase. It could be a real rocket, but could also simply refer to attacks by (this) katibah," he said. Gigih had travelled to Singapore several times in previous years, but not since the cell was detected. Brigadier-General Budigusdian added that Gigih and his cell members had become radicalised over the Internet, some only recently. Given that they work in high-tech companies, they might also have the mechanical skills to build a rocket, he added. Police are also exploring links to militants elsewhere in Indonesia, including those in Poso in Sulawesi, Solo, and individuals such as convicted radical ideologue Aman Abdurrahman. Investigators are also on the hunt for "pengantin", or "bridegroom", the euphemism for suicide bombers, he said. Nur Rohman, the bomber who attacked a police station in Solo last month, was actively communicating with the group, he added. The group also helped smuggle Uighur militants into Indonesia. Batam district police chief Helmy Santika has clarified that the Uighur radical known as Doni, who was deported to China after entering Batam illegally, did not pass through Singapore - which he had earlier been reported as saying - but through other points in the region. Batam's porous borders make it an easy hub for aspiring militants to pass through. But the authorities say they cannot let their guard down as ISIS poses a graver threat and threatens to attack anyone who does not subscribe to its blinkered worldview. Senior Commissioner Helmy said a new breed of terrorists appears to have adopted new techniques to avoid detection - living as ordinary persons and calling their groups names like Katibah GR that bear no hint of links to established terror groups. But they pose a just-as-great or greater danger to this region and its people than older networks like Al-Qaeda or Jemaah Islamiah did. Said Mr Budigusdian: "What we don't want is for them to use Southeast Asia as a base to the point where a war like the one in Syria breaks out."